Working with multiple images open at once in Photoshop has always felt a bit clumsy and frustrating, usually requiring us to click and drag several document windows around on the screen to get to the one we want. If you've been wishing for a better way to manage multiple documents in Photoshop, you'll definitely want to check out the new tabbed document windows feature in Photoshop CS4! 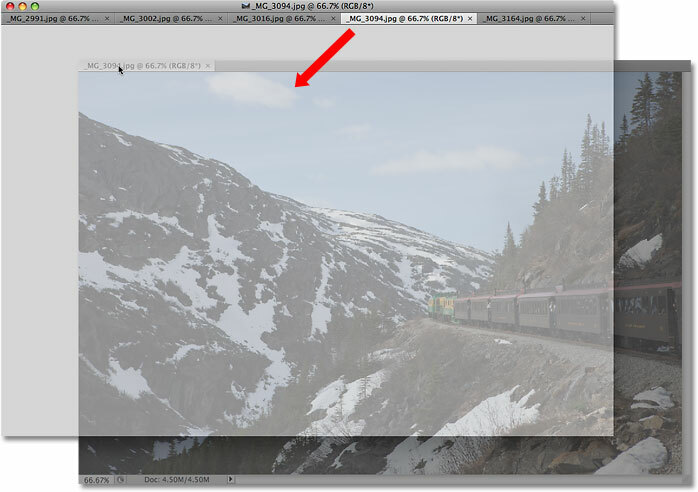 Choose File > Open to open images from inside Photoshop. Select the first image, then Shift-click the last image to select all images at once. The images appear nested in a single document, with each image given its own name tab at the top. Switch between images by clicking on the name tabs. Each tab contains the exact same information you'd expect to find at the top of a standard document window in Photoshop, including the name of the image, the current zoom level, the color mode, and the current bit depth. Drag the tabs left or right to change the order of the images. 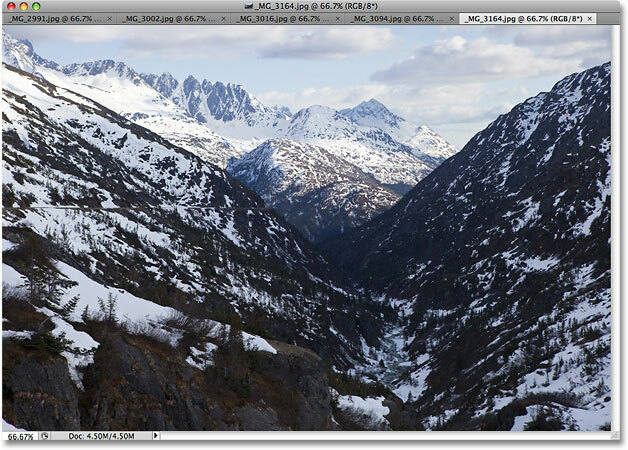 You can cycle through the images using a couple of handy keyboard shortcuts. Press Ctrl+~ (Win) / Command+~ (Mac) to move forward through the tabs, or Ctrl+Shift+~ (Win) / Command+Shift+~ (Mac) to move backwards. The "~" is the tilde key which you'll find in the top left corner of the keyboard below the Esc key. In previous versions of Photoshop, you could cycle forward through multiple document windows using Ctrl+Tab (Win) / Control+Tab (Mac) or backwards with Ctrl+Shift+Tab (Win) / Control+Shift+Tab (Mac). These older keyboard shortcuts still work in Photoshop CS4, so its your choice which ones you want to use. One potential bit of confusion to keep in mind is that Photoshop moves through the images in the order they were opened, not necessarily the order they appear in on screen. If you've re-arranged the order of the images in the tabs and then use the keyboard shortcuts to cycle through them, Photoshop may move through them in an order different from what you expected. Select images from the fly-out menu if not all name tabs can fit on the screen. Drag an image away from the other tabs to float it in its own document window. You can also choose Window > Arrange > Float in Window. Go to Window > Arrange > Float All in Window to move all open images into independent document windows. Simply click and drag the image back into the tabs to return it to the group. Release your mouse button when the blue highlight border appears. Go to Window > Arrange > Consolidate All To Tabs to quickly regroup any floating document windows. Click the small "x" icon to close a single image. Go to File > Close All to quickly close all tabbed document windows. Uncheck the "Open Documents as Tabs" and "Enable Floating Document Window Docking" options disable the tabbed document windows feature. Click OK when you're done to accept the changes and exit out of the dialog box. To enable the tabbed document windows feature at any time, simply return to the Preferences and select those two options again. To quickly bring up Photoshop's Preferences, press Ctrl+K (Win) / Command+K (Mac), then select Interface from the menu on the left of the dialog box. And there we have it! That's our look at the brand new tabbed document windows feature in Photoshop CS4! Visit our Photoshop Basics section to learn more about the basics of Photoshop!